Betway have a promotion that runs every week from Saturday to Friday whereby you bet £25 on a treble and receive a 2 x £5 free bets. This offer is very quick and easy to do, and it should definitely be part of your weekly matched betting routine. All events and markets eligible. Opt In required. A treble is basically a bet on 3 outcomes at the same time. All 3 must win for the bet to win. The following strategy will show you the easiest way to attempt this offer using Betfair's ACCA markets. You can lay these bets like a normal ACCA but it's so much quicker if you use the ACCA market and lay them off in one go. Using this method requires no knowledge whatsoever of ACCAs as you'll see below. Because of this, you will be sticking to football for the offer. Opt in is only required once for life. Betfair Exchange offer trebles on the Premier League, Champions League, and midweek football in general. To find their treble markets, you need to search for "ACCA" in the search bar or click here. The results page should look like this. If you click on one of the ACCA results, you will see selections with 2 teams, 3 teams, 4 teams etc. You want to find a market that has only 3 teams. In the example below, the only one you would want is Barcelona/Man City/Celtic. This is the selection you will be choosing. As you can see, the lay odds are 3.95. Betfair update the market throughout the day with more selections so it's worth checking in the evening around 5pm/6pm mid-week, or just before 2pm on weekends. This part requires a little knowledge of football. In the example, you'll need to now find the Barcelona game, the Man city game, and the Celtic game. Once you've found them, add them all into your bet slip and stake £25 in the "trebles" box. The odds displayed are the total back odds, this must be above 3.0. Double check that you've bet £25 in the Trebles box, and that your Total Stake is £25. As you can see from the example, the total back odds were 3.58 and the exchange lay odds were 3.95. Because both bets are exactly the same, you can simply lay it off as normal on the exchange. At 5% commission you'd have a £3.20 loss which isn't great (the odds tend to get better later on), but you get £10 in free bets. 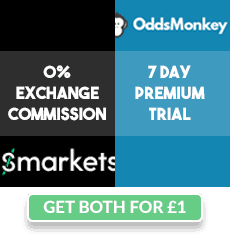 Smarkets and Matchbook also have ACCA markets which it may be worth checking for lower commission. You will receive your first £5 free bet on Saturday 12:00 (expires Monday 12:00) and your second free bet on Monday 14:00 (expires Friday 14:00). I suggest betting on a team or horse with high odds (4.0+) to convert these into £3-£4 profit each. This offer can be repeated weekly. The free bets don't have to be used on accumulators too, they can be used on anything. Free bets valid until 14:00 Monday and 14:00 Friday respectively. Try to use them within 48 hours. This is the quickest method. For closer matches you can lay sequentially using Oddsmonkey's Acca Finder. That is a more advanced method and you should check out the ACCA guides if doing that method.